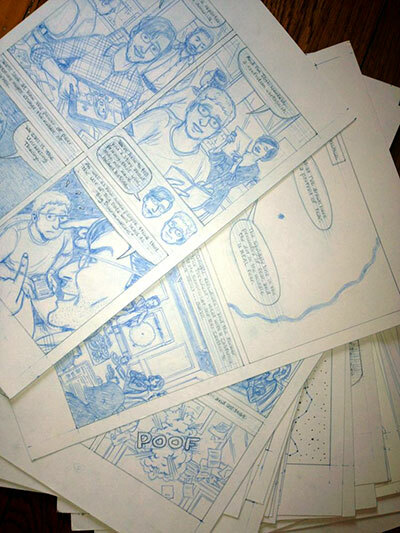 I’m currently in the middle of a really cool comics project for Al Jazeera America‘s interactive multimedia team. In conjunction with AJAM staff reporter Michael Keller, it’s a process piece on big data and privacy, especially in relation to our roles as consumers. Michael came to me with the project, having already done a ton of research and reporting on the topic. Once I came on board, we did more reporting, wrote the script together (with great help from our editors), and now I’m penciling it. Not to give away too much in advance, in the story we get into the pros & cons of such “free” services as Gmail, Facebook, and Foursquare, as well as the increasing popularity of devices like Progressive’s Snapshot and activity trackers like the Fitbit. Some of the experts we talk to include former California State Senator Liz Figueroa (one of the first politicians to recognize the privacy implications of Google’s Gmail), cyber-security researcher Dan Geer, privacy law experts Scott Peppet and Paul Ohm, social researcher danah boyd, and Alessandro Acquisti (who studies the economics of privacy)—as well as a bunch of “regular folks.” Also making an appearance: Al Gore! Imploding robots! The Database of Ruin! Being that the piece will live on the web, it’ll also include some multimedia functionality, à la A.D. on Smith and The Stowaway on The Atavist. It’s been a fascinating piece to work on, and really the perfect thing for me. Michael did the bulk of the research and reporting, but I’ve been integral to shaping the script, and of course drawing the thing. I’m also excited to be working with the new-on-the-scene news organization Al Jazeera America. It’s been a labor love project so far: I came on-board in February and we spent at least two months just reporting and writing the script. I’ve been penciling since May. I should begin inking, coloring, and finalizing the piece after next week; we hope to debut it on Al Jazeera America in mid-to-late August. It’s going to be close to 40 pages in length!